It was the night before my son’s day camp began and I had not been to the store in a week. I was looking over the list of things I was supposed to pack for him including a lunch and snacks. The previous week we had had 2 little boys in the house and they had eaten every snack in the place. Goldfish? Gone! Popcorners? An entire bag eaten in one afternoon at the pool. Raspberries? Devoured with pancakes. Graham crackers? Polished off. All I had left to offer my son’s lunch besides a turkey sandwich was some stale tortilla chips. I started to poke around the kitchen and think….it wasn’t too hot for a summer night, I could turn the oven on, we’ve got butter, sugar, flour…but dangit no eggs. Know what? You don’t need eggs to have cookies. And if you or your baby are allergic to eggs this is great news. You just need the right technique to make the cookies come out right. The result is wonderfully crisp light cookies. 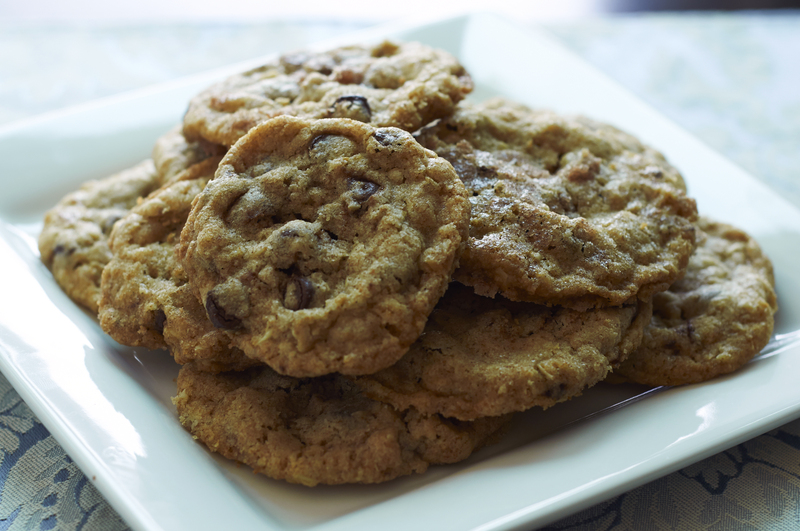 If you are a chocolate lover and crave sweet things, you will love these with chocolate chips. If you like a bit of sweet and savory flavors mixed together skip the chocolate and use lemon zest instead for a more subtle flavor. In a medium bowl, cream together the butter and sugar until light and fluffy. Stir in the vanilla and almond extracts. Stir in lemon zest (if using). Sift together the flour, baking soda, and salt; stir into the butter mixture. Finally, mix in the rolled oats. Add chocolate chips if using. Roll dough into balls about 1 inch in diameter. Place the dough balls about 3 inches apart onto the prepared cookie sheet. Because of the lack of egg to bind the dough together, these cookies will spread so be sure to give the 3 inches of space or else you will end up with one massive cookie on the sheet. Using the ball of your hand or the bottom of a glass, press to flatten down the cookie. Bake for 8 to 10 minutes, cookies should be slightly browned. Let cool on the baking sheet for 10 minutes before transferring to a wire rack. Store in an airtight container. This entry was posted in Snacks and tagged baking, chocolate chips, cookies, eggless, no eggs, oatmeal on July 21, 2014 by nursingmomscook. There’s nothing a mom loves more than a meal that satisfies all your nutritional and taste bud needs in one dish. Right now that dish for me is a quiche. Its got your carb group, your dairy group, your protein group and your vegetable groups all in one place. My summer CSA has started up and I already have greens in my refrigerator that defy my usual comfort zone. Turnips, garlic scapes, collard greens. Whenever I’ve had collard greens they usually accompany barbecue and to be honest, I’m not a huge fan. They are limp, flaccid, over-sauteed. When fresh they are leafy and green and I know I can do better that the mushy stuff I feel like I’m supposed to like but never really do. 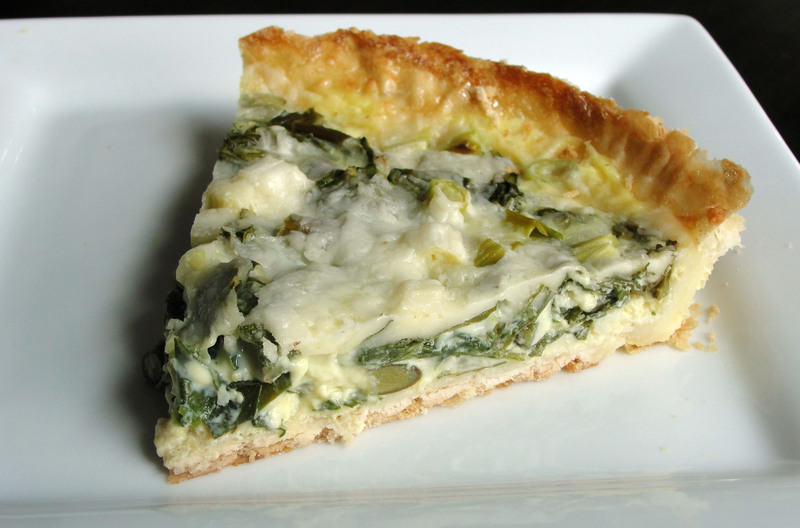 But baked in a quiche they add a fresh crunch of healthiness. If you don’t have collard greens you can substitute kale, Swiss chard or another hearty, leafy green. For a gluten free version look for a pre-made GF crust in your local store. I find mine in the freezer section of my natural market. Preheat the oven to 450. Roll out the crust and fit it into a quiche pan or pie plate using foil to protect the top edges. Using a fork, poke a few holes in the bottom. Bake until light golden brown, about 15 minutes. While the crust is baking, beat the white of one egg in a small bowl. Remove crust from from oven. Brush thoroughly with egg white and bake for 2 more minutes. Remove from oven and reduce temp to 375. Heat the butter in a large pan over medium-low heat. Add garlic scapes and sautee for 8 minutes or until soft, stirring regularly. Add the garlic and sautee for one minute. Add the collards and toss to cover with butter. Cook until limp, about 2 minutes. Remove from pan into a bowl to cool. Beat the 2 eggs and 1 yoke together with the milk until smooth. Fold in the vegetable mixture. Season with salt and pepper. Scatter half the cheese evenly over the bottom of the crust. Pour in the egg mixture top with the rest of the cheese. Top with chopped scallions. Bake for 25 minutes or until set in the center. Cool for 10 minutes before serving. 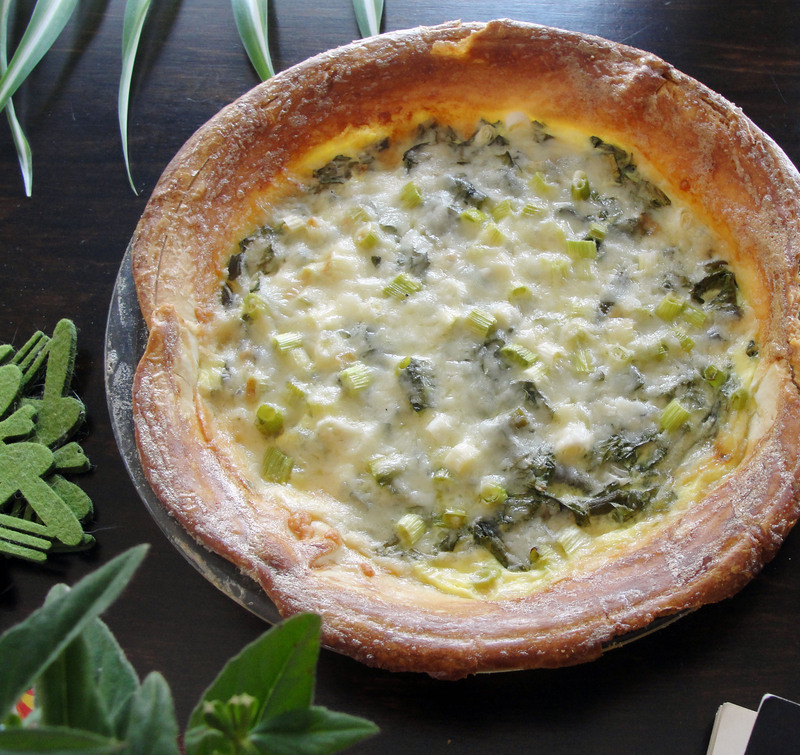 This entry was posted in Dinner, Lunch and tagged Alpine blend, collards, crust, dinner, eggs, fintina, garlic, greens, gyuyere, healthy, lunch, quiche, scallions, scapes on July 11, 2014 by nursingmomscook.